Alexandria, Virginia has a variety of restaurants ranging from casual eateries to elegant fine dining establishments, making this historic Northern Virginia town a fun place to explore and enjoy a great meal with family or friends. 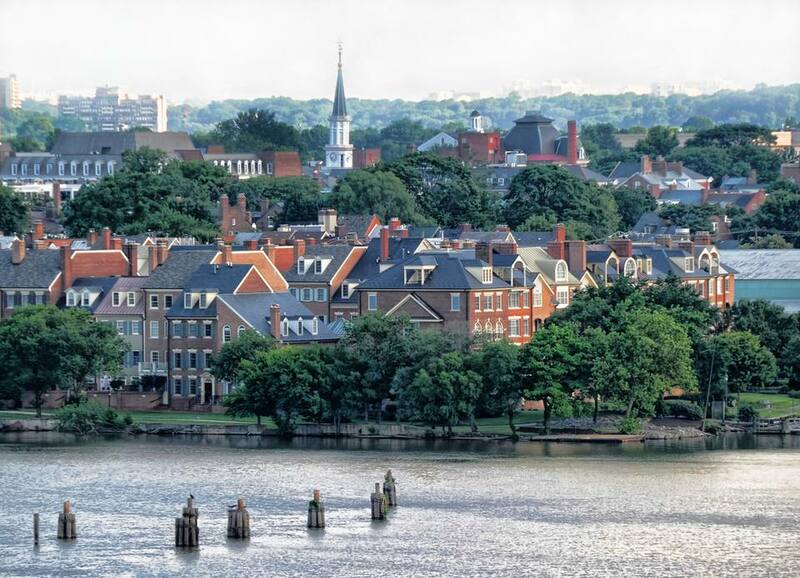 Located just a few miles south of the nation's capital in Washington, D.C. along the banks of the Potomac River, Old Town Alexandria is a quaint but large city that caters to tourists and residents of the capital. Perfect for exploring on foot, Alexandria is also full of great food options from around the world, and both indoor and outdoor seating is available, so you can enjoy the perfect summer weather or cozy up against the winter chill. The following restaurants are some of the best in the area, but reservations are recommended, especially on weekends and holidays when lawmakers, tourists, and residents of the area come out in droves to casually stroll through this historic town and eat at its plethora of fine dining establishments. Ashlar is a special restaurant because of its unique setting in a small boutique hotel in the heart of Old Town Alexandria, making for an impressive restaurant with a beautiful setting for intimate dining. Offering a variety of American Colonial classics, Ashlar is named after Freemasons known as "perfect ashlars" who grew up into society men through the refining process of education and diligence. Living up to its name, Ashlar only chooses the finest ingredients from locally sourced farms and ranches and offers some top-notch local spirits, too. Named one of Washingtonian's "100 Best Restaurants" in 2013, Vermilion is located in the heart of Old Town Alexandria and serves contemporary American cuisine in a cozy atmosphere. Chef Thomas Cardarelli's regional menu focuses on local and seasonal ingredients, and a Farm Table is even available on the first and third Tuesday of the month, featuring a six- to eight-course meal. Located in the Kimpton Lorien Hotel & Spa, BRABO offers innovative Belgian cuisine by award-winning chef Robert Wiedmaier, who's created a menu that is both creative and varied. BRABO is the name of a hero in Belgian folklore, and the meals combine French and Belgian styles of cuisine for a truly unique blend of flavors. As the name would suggest, this small restaurant in Old Town Alexandria specializes in French cuisine—with a modern twist.​ Chefs Christophe and Michelle Poteaux's award-winning Bastille Brasserie and Wine Bar also serves small plates in the bar and offers patio dining seasonally. With weekly specials like "One-Third Off Thursdays" and "Mimosa Brunch Saturdays and Sundays" and daily happy hours, Bastille is a great place for a quick bite and drink or a full meal with all the fixings. Named after executive chef and owner Douglas Laporta, Laporta's Restaurant offers a casual, comfortable dining experience paired with exceptional seafood and pasta-variety meals. There's even a jazz lounge attached to the restaurant featuring live jazz music nightly, so, even if you just want to stop in after work to unwind with a quick bite, Laporta's is a great choice in Old Town Alexandria. The Majestic is an art deco-style historic landmark restaurant that has been restored, and the menu specializes in contemporary American cuisine. At the Majestic Cafe, Corporate Executive Chef Graham Duncan offers a contemporary bistro-style menu featuring seasonal favorites and a combination of rustic simplicity with carefully crafted compositions to make for a truly enjoyable dining experience. Gadsby's Tavern in Old Town Alexandria is a historic landmark dating back to the 18th century and was frequented by George Washington, Thomas Jefferson, John Adams, James Madison, and James Monroe. The food is excellent, and the atmosphere exudes late 18th century charm, featuring dishes that have been served here since 1770 served on candlelit dining tables. Hank's Oyster Bar has become a neighborhood hotspot, offering a small, friendly, and casual restaurant in which to gather with friends. Hank's five locations in the Washington, D.C. area serve some of the freshest seafood around ​and even feature daily half-priced raw bar options from 10 p.m. to 12 a.m. This modern American Brasserie offers a unique venue in the former home to the Columbia Steam Engine Fire Company, which dates back to 1871. The menu features seasonal dishes ranging from the raw bar to housemade sausages and farmstead cheeses, steamed mussels, Chophouse steaks, and daily fresh plates. With seating options available in multiple dining rooms, an atrium, and an outdoor patio, this restaurant in the heart of Old Town is perfect any time of year. If you're planning to travel to Old Town Alexandria in the early part of the year, Restaurant Week is a great way to try out some of the best dining the city has to offer for a fraction of the price. Restaurant Week features $20 to $35 fixed-rate meals at a number of the above establishments.